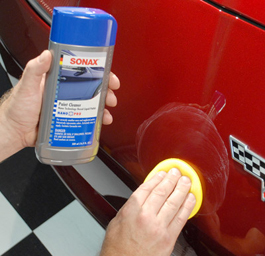 SONAX Paint Cleaner is the ultimate pre-wax cleaner for SONAX NanoTechnology Liquid Wax. The mild abrasives within SONAX Paint Cleaner gently remove oxidation and fine imperfections, providing a smooth, vibrant surface. The highly effective cleaning agents in SONAX Paint Cleaner are designed to remove oxidation and wax build-up from heavily weather-worn finishes. The abrasives smooth out fine blemishes and brighten the paint’s color to enhance the gloss of the final wax coat. SONAX Paint Cleaner is not recommended for vehicles less than a year old. But on older finishes, SONAX Paint Cleaner really makes them shine. SONAX Paint Cleaner can be applied by hand or polisher. Wipe SONAX Paint Cleaner over the paint one section at a time. Use a soft microfiber towel to buff away SONAX Paint Cleaner. Carnauba wax in SONAX Paint Cleaner gives the paint vibrant gloss and protection. Nano wax particles fill in small scratches to create the smoothest possible paint finish. Once Sonax Paint Cleaner is applied over the pre-polished paint, imperfections will virtually disappear. SONAX Paint Cleaner uncovers a fresh, like-new paint finish by removing old, dead paint from the paint’s outermost layer. The tiny abrasives gently remove these particles while the carnauba nourishes and brightens the paint underneath. Deep, rich color will be instantly restored. For the ultimate shine and long lasting protection, apply Sonax NanoTechnology Liquid Wax after using Sonax Paint Cleaner. The wax will seal in the carnauba already deposited by Sonax Paint Cleaner so the paint will retail its smooth shine. Sonax Paint Cleaner can be applied by hand or with a polisher. 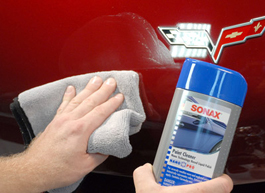 SONAX Paint Cleaner works like a fine renewal cream for automotive paint. 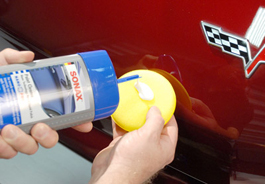 Used as a final step before wax application, SONAX Paint Cleaner will make your vehicle’s paint look new again. I ordered this after a review from the master detailer Todd Cooperider; I tried it on an old Honda R81 red hood. as directed I did a small 2x2 patch on this old weather/chalky paint I was amazed how nicely it looked. Restored the original shine & gloss with a few mins work by hand with an old partially use foam applicator.. I them applied the Nano wax for addl shine and protection . Im watching this hood's protection to see huw long it will last.. As Im going to paint a new hood for this car soon. The whole car will be polished and waxed at that time % will look like new again.. AMAZING ! I highly recommend the Sonax Products. ProsEasy to use by hand & with a random orbital buffer. took out minor swirls & lite scratched on my old 1998 Subaru hood & discolored headlites. This stuff is thin and runny. Would not remove a stubborn stain on single stage white. Klasse took it off with little effort and left a beautiful shine. Takes way more effort so why bother? This stuff is great. I use it after clay and before wax or LSP on quicker jobs. It restores depth and clarity to the paint finish, removes minor swirls, and leaves an ultra slick finish. I apply it with a PC on the mid settings, it couldn't be any easier to apply or remove. It's like cleaner wax on crack. I have tried many professional paint cleaners in the 14 years I have been professionally detailing cars. SONAX Paint Cleaner is hands down the finest and easiest to use product for cleaning the paint prior to using SONAX Liquid Wax. Use the combination, get the results without the hassle, cost, and vested time in producing a high quality finish!